My second wallpaper~ another Tsubasa one. Think it's a scan? Heh. Look again! This wall took me ages... I worked on it fairly steadily for about a week (maybe more) and then just picked it up and worked on it all night because I couldn't sleep. It's not EXACTLY done but it's 90% done, and my brain and eyes are more or less dead after stupidly staying up, so suggestions or comments on this wall would be nice. The main scan of Sakura and Syaoran I got from chuayw2000 After I extracted what I wanted you can imagine my dilemma. I mean look at all the text all over this thing. At this point I kind of wanted to cry and die. But before then, I decided to work on the background. The cherry blossoms in the background I got from atzur. 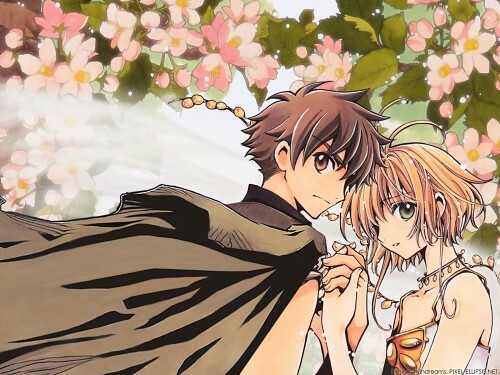 Again, loads of extraction, cropping, moving blossoms to strategically cover Syaoran's hand... recoloring to wipe out Syaoran / Sakura in the middle... etc. etc. It actually wasn't too bad as I remember. Then I went back to the original Syaoran and Sakura scan and wanted to cry some more, but then I had the brilliant idea to find a PRISTINE Syaoran's cloak and drape it over him! It took some trial and error, but I found a good cloak for him from Aerith0530. After some flipping, manipulating, and coloring in additional wrinkles so that the cloak folds the right way, voila! I managed to cover up most of the offending text. Sorry for the long description, but I'm writing this to remind myself... no wallpaper again for a long time... until I can learn moderation... but hope you all will enjoy. P.S. The title's inspired by one of Tsubasa's main theme songs' lyrics... and I was stylistically inspired by Tysoh's beautiful wall. 6/30/05: Added in a shadow crease to Sakura's hand, straightened some of Sakura's lines, cleaned a bit of blue out of her hair that I missed before... Tried smudging Syaoran's cloak, which looked ok, but then I decided to stick with the original "rugged" look. 10/30/05: In the spirit of taking other people's advice... I finally caved in and smudged Syaoran's cloak so that quality-wise it looks consistent with the rest of the scan now. I also went over some of the worst jaggies with the eraser + smudge tool, and smudged some of the background flowers just a teensy bit. 6/6/06: Made and updated 1600x1200 version. Wow, cool background i like it. really good job, it must of put a lot of effort into that, because its really good. Good job, and hope you keep it up. omg! its so beautiful! it makes me wanna cry! i love it! omg! You sure have nicely repainted on the two caracters. It's as if there was no text at all on Sakura to begin with. It's also a really cute setting. But the part of the cloak you added from an other scan doesn't fit so well. You should add a bit of red in it I think to be more in the same tint. And maybe the Diffuse filter could help to make it look like the quality of the first scan. This is very beautiful. ^_^ I love the flowers, and the coloring you did on the characters is very good. Wonderful job! Nice wallie! It looks great! The cherry blossoms are nice and both Syaoran and Sakura look wonderful. Excellent job! Must've took you a very long time. I read everything you wrote and I say : awsome work!!! wonderful! this wall is so pretty! you can tell its been worked on really hard. Must say not bad for second wall. I can a developement in extraction, pretty clean, although some parts might need to be clean much thourough . To me i like the overall look, it looks really nice in thumbnail. The color are nice , sharps and very clean. However, It feel that u need to preserve this quality in the fullview as well. It's nice as it is nice, but having these qualities will enhance your wall much more, thus do more justice to your concept. I must say nice wall. Keep it up, you're making a nice progress ^_^. But... the cape of Shaoran seems to be a little blurred and it doesn't really goes with the global high quality of the picture.. sad. Thanks a lot for, good work! Ooh! This wallpaper is so lovely. It is really sweet. Great work, overall. You did very well with getting rid of the text. As someone else said, your hard work definitely paid off.